Talented group of musicians playing authentic hot Latin with a generous helping of spice. Salsa, merengue, lambada, cumbia and more for parties, weddings or full-on salsa dance nights. 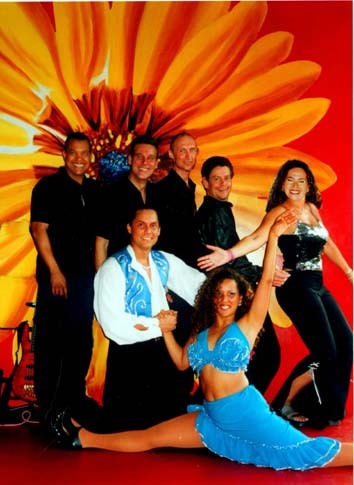 Coco Xpress is a four to six-piece Latin band playing popular salsa and merengue dance hits. With salsa, merengue, lambada, cumbia and more – representing all the popular Latino rhythms and countries, from Cuba to Colombia via Santo Domingo – this band guarantee an excellent night’s entertainment for top dancers and left-footed tropical party-goers alike. ‘Coco’ means coconut in Spanish, and the band is guaranteed to bring you all the flavour and heat of Latin America and the Caribbean. Coco Xpress features Latino singer Guillermo, with not only a rich voice but also an entertaining manner and some hilarious routines. Also in the front line is female alto sax/flute player Nina: not only a strong musician but also a smooth dancer to make the band as easy on the eyes as it is on the ears! The line-up is rounded off with Rivera swinging on bass guitar, Dominican Wilson ‘El Diablo’ – a maniacal devil at the piano – and Colombian Emerys on conga drums, a talented group of musicians who know that on-stage presentation and lively performance is every bit as important as talented musicianship. As a four piece band, they comprise three singing musicians playing hand percussion, bass guitar, sax/flute and live keyboard, with sequenced percussion. With the addition of a fifth musician one has a live conga drum player and the sixth – icing on the cake – instrument is usually trumpet. Coco Xpress is equally suitable for parties, weddings and corporate events as it is for full-on salsa dance nights, and will bring a repertoire of songs appropriate for whichever occasion. They can also provide CD music between sets, dance classes, DJ’s and other ideas to make the evening swing. They are based in London, with frequent appearances in the capital’s busiest salsa venues, but will travel anywhere and recently completed a three week residency at at the Holiday Inn, Eilat. Recent Clients: a weekly residency (for 14 months) at the prestigious Dover Street Wine Bar; HRH Crown Prince Abdullah of Saudi; a wedding for the presidential family of Egypt; British Airways; London Airport; Mappin & Webb; the Christmas/New Year Races at Kempton Park; Grosvenor House Hotel; Royal Festival Hall Christmas party; Dubai Creek Golf Club, and many many weddings, office parties, themed events, etc.